Aerodyne Research has been at the forefront of innovative parachute designs for Sport Parachute Jumpers for two decades. Main parachutes are on offer for student novice levels to intermediate and expert and through to international competitors at World Meets. FAA / T.S.O. 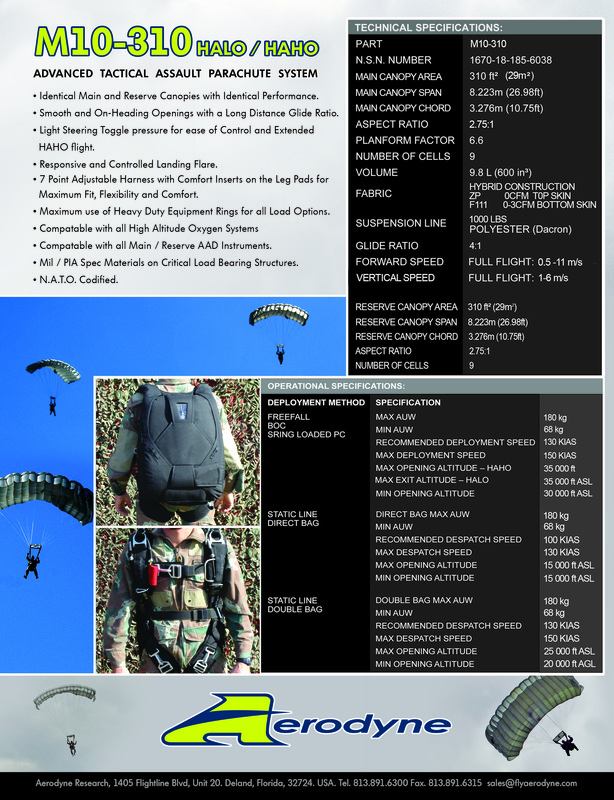 Reserve Parachutes in 10 sizes as well as custom crafted harness / container systems make up a single source producer for such special Parachute equipment for knowledgeable International Skydivers. Aerodyne Parachutes have international acceptability on every continent. Discerning Skydivers from more than 45 nations around the globe have purchased Aerodyne Parachutes; who demand only the finest parachute products available. Aerodyne Research has now designed and is manufacturing Military Parachutes, to meet the demanding requirements of International Armed Forces Worldwide. Military Parachutes have been designed and innovative materials incorporated, to take Military Troops safely onto rugged and hostile Drop Zones. Such exacting conditions require superior performance, manufactured to the highest International Military Specification Standards. On offer today, we proudly display our Troop Parachutes, our Tactical Assault Parachutes, and our Aerial Delivery Cargo Parachutes. Not on display on these pages, are specialty Parachutes such as retardation Parachutes for specific applications, as well as Illumination Flare Parachutes which light up the battlefield for the friendly troops.